Ever since his screenplays for Dirty Pretty Things and Eastern Promises, Steven Knight has been one of Hollywood's most reliable writers. However, he's still getting his feet wet as a director, with only the Jason Statham action flick Redemption and the excellent "Tom Hardy drives" drama Locke under his belt. Knight's third effort, the mysterious island thriller Serenity, is his most ambitious film by far with the starriest cast he's ever worked with. 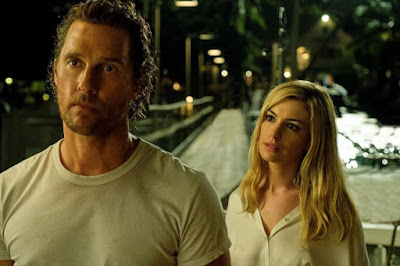 A reunion between Matthew McConaughey and Anne Hathaway, who are joined by Djimon Hounsou, Jason Clarke, Diane Lane, and Jeremy Strong, the film centers on a fishing boat captain whose simple life is disrupted by his ex, who wants him to murder her husband. But there's something more going on here that appears to border on the paranormal, making this a potentially surprising sleeper for early next year. Oh yeah, about that release date. Serenity was meant to open last September, however lukewarm response to the trailer saw it pushed back a month, and now all the way to January 25th 2019. Not exactly promising, but how can you possibly write off this cast and such a talented filmmaker? Here's the synopsis: Serenity: A fishing boat captain’s (Matthew McConaughey) mysterious past, in the form of a glamorous woman (Anne Hathaway), crashes up against his simple life on a small island in the Caribbean and ensnares him in a new reality that might not be all it seems.